“This deceptively simple novel-in-verse is a beautifully emotional, poetic treasure. Shari Green’s writing is captivating and she has created, in Macy McMillan, a complex, true-to-life, sensitive preteen girl…. This is the type of book readers will find themselves reading cover to cover in a single sitting, and since it is written in verse, that is entirely possible. Green’s writing is superbly lyrical, touching, and likely to stick with readers for a long time…. More than once, I found myself thinking of Eleanor Estes’ classic The Hundred Dresses. While the gut-wrenchingly sad undertones of that novel are quite different from this one, both invoked strong emotions in me, and both feature similar themes of a young girl coping with extreme challenges – Macy with her disability, and the other novel’s protagonist with unbearable poverty. This novel, however, is emotionally powerful without being morose. It is simply real, and its message of accepting true happiness and living life to the fullest is beautiful and inspiring. “Oh my goodness, my heart is so full after reading this book (for the second time)! Yes, it is that good. I’m trying to define all my emotions but they are jumbled up together. Please read! The book is written in a free poem style. Do not let the format put you off from reading this fantastic book. The words are few but the story is rich and complex…. “My thoughts: I loved this one. I really liked Macy. But I loved, loved, loved Iris. Together these two make for a GREAT read. I also enjoyed the other characters in the book. (Her best friend, Olivia, her mother, her step-father-to-be, Alan, her step-sisters-to-be, Kaitlin and Bethany.) Macy is a flawed heroine–my favorite kind. So in terms of characterization, this one was wonderful. 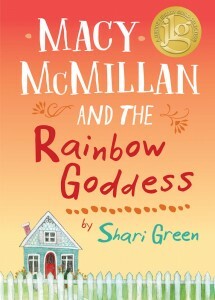 “Macy McMillan and the Rainbow Goddess by Shari Green is a novel in freeform poetry about a girl trying to come to terms with the big changes in her life. Big changes coming: a new school at the end of sixth grade, a new house, a step dad, and step-siblings (twins)…. The poetry and type face help to express both Macy’s emotional state and the rhythm of sign. ASL has its own grammar — something that is lost when writing out dialog into standard prose. By keeping the lines short and focused on the core actions, items, emotions — there’s more of a sense of how Macy is actually thinking and expressing herself…. Though Macy’s town is never given a name, there are enough clues to suppose it’s somewhere on the north eastern edge of Vancouver Island. The author is from there and it shows in how she lays out the geography of Macy’s world.